The next time you or a loved one has to spend time in a hospital, you may encounter a new kind of physician: a hospitalist. Hospitalists are physicians or mid-levels (nurse practitioners and physicians assistants) who specialize in the medical care of hospitalized patients. While the term “hospitalist” was coined just a few years ago, the concept itself is not entirely new. Physicians specializing in critical care medicine, for example, have often limited their practice to hospitalized patients. But, while critical care physicians typically spend most of their time in intensive care units and trauma centers; hospitalists care for patients in all areas of the hospital, and serve both an adult and pediatric population. Hospitalists typically have limited or no outpatient office responsibilities and so can devote their full time and attention to patients who are in the hospital. Once patients are admitted, the hospitalist takes on responsibility for their care for the entirety of a patients’ stay. After discharge, care reverts back to a patient’s primary care provider or pediatrician. The hospitalist role is based on the concept that the more experience a physician has with in-hospital care, the better the quality of care. Some research has proven this to be true. Hospitalists can offer increased experience with inpatient conditions and procedures, and, hospitalists don’t have to juggle a busy office schedule with hospital rounds. The hospital is, in effect, their office. This often results in shorter hospital stays, because hospitalists are on hand full-time to order tests and approve discharges. The partnership between Floating Hospital for Children at Tufts Medical Center and Signature Healthcare Brockton Hospital is an example of this relationship. Floating Hospital for Children is a full-service pediatric hospital located on the downtown Boston campus of Tufts Medical Center. 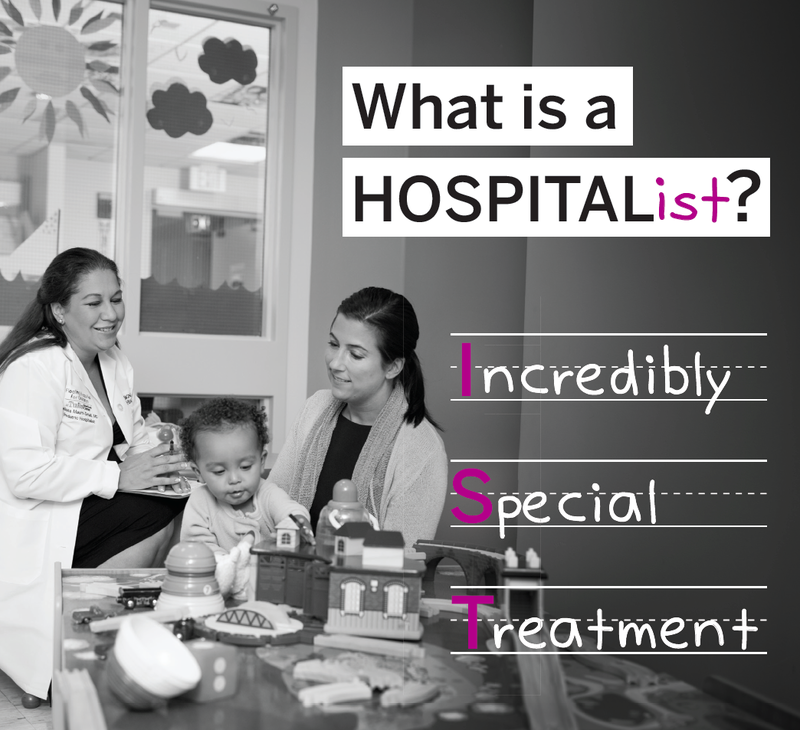 Pediatric hospitalists from Floating serve as child advocates and expert guides for Signature Healthcare patients. They are board-certified pediatricians who care for children on the pediatric unit 24 hours per day, 7 days per week for individualized medical care and provide information and support for families. The pediatric hospitalists are on hand to review test results quickly, consult with additional specialists that may be needed, and answer questions. In addition to the benefits they provide in the hospital setting, hospitalists also can improve the quality of care and patient satisfaction in physicians’ offices. Office-based physicians who work with hospitalists don’t have to make frequent trips to the hospital, so they can instead concentrate more fully on their office appointments and calls. Patients who may be a little uncomfortable at the prospect of seeing a different doctor while they are in the hospital can rest assured: Their personal physician will not be kept out of the loop. Hospitalists inform patients’ personal physicians of all major decisions made in the hospital and send them complete discharge summaries. In fact, surveys have shown most patients are happy with the care they receive from hospitalists. At Signature Healthcare, a full summary of a child’s hospital visit is provided to the child’s pediatrician by a Floating Hospital for Children hospitalist after they are discharged from the hospital. They work alongside neonatologists to care for the tiniest of newborns in the Level 2 Special Care Nursery, collaborate with Emergency Room physicians to provide the best care for children who come through the doors, and manage children into late adolescence on the pediatric inpatient unit. Dr. Melissa Mauro-Small is the Medical Director of the Pediatric Hospitalist Program at Signature Healthcare, a partnership with Floating Hospital for Children at Tufts Medical Center. She graduated from the Boston University School of Medicine and completed postgraduate training at St. Christopher’s Hospital for Children in Philadelphia, PA. She is board certified by the American Board of Pediatrics, and is a Fellow of the American Academy of Pediatrics. Dr. Mauro-Small spent four years in the Air Force and was a primary care physician in Mississippi, and loves spending time with her 3-year old daughter.